Cheetah Conservation Fund (CCF) and Colorado State University (CSU) today announce the 2018 Pathways Africa Conference and Training will be held from 6 to 11, January 2018, at the Safari Hotel in Windhoek, Namibia. A programme initiated by CSU designed to address the myriad of issues that arise as people and wildlife struggle to coexist in a sustainable and healthy manner, Pathways Africa is open to the public, and people from around the world are invited to attend. The Large Carnivore Management Association of Namibia (LCMAN) and the Namibia Nature Foundation (NNF) are partnering with CCF and CSU to bring Pathways Africa to Namibia, the second international venue for the conference. The theme of the 2018 Namibian Pathways event is “Living with Wildlife”. Pathways Africa follows on the success of Pathways Kenya, held 10 to 13, January 2016, in Nanyuki, Kenya, which brought together more than 200 scientists from 27 countries representing academia, NGOs, and government agencies. Picking up where the first international conference left off, Pathways Africa 2018 in Namibia is designed to increase professionalism and effectiveness in the human dimensions of natural resource and wildlife management. The goal is to set the precedent for future research, innovation, and collaboration and extend the application of these disciplines in Sub-Saharan Africa and beyond. “We are excited to be co-hosting Pathways Africa 2018 in Namibia. There are so many innovative and interesting wildlife management projects based on our continent. 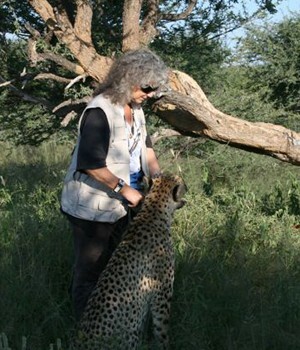 Pathways Africa will bring together visionary wildlife managers, leaders in conservation policy, and students and academics who are forging new frontiers here, so we may learn from each other”, said Dr Laurie Marker, Founder and Executive Director of CCF and one of the event’s lead organisers. “We are extending the invitation to university students and non-professionals as well who care deeply about wildlife and the fate of our planet. We hope they will attend to share their ideas and energy, too”. Key topics for the conference will include: The Changing Nature of Wildlife Conservation; Wildlife Trafficking and Demand Reduction; Landscape Connectivity; Human-Wildlife Conflict; Community-based Conservation; Linking Science to Action; Policy and Legislation, and Transboundary Species Management. Confirmed keynote speakers will include Maxi Pia Louis, Director of the Namibian Association of Community-Based Natural Resource Management Support Organisations (NASCO), and John Kasaona, Executive Director of Integrated Rural Development and Nature Conservation (IRDNC). Both are representatives of community-based organisations in Namibia. Conference sponsors are USAID East Africa; WWF; Air Namibia; LCMAN; NNF; FNB Bank Namibia; Bronx Zoo; Colorado State University/Warner College of Natural Resources Human Dimensions of Natural Resources, the Namibian University of Science and Technology, the Namibian Ministry of Environment and Tourism, and Cheetah Conservation Fund. Pathways Africa will include a three-day training workshop prior to the conference for early and mid-career field staff, taking place at the same location from 6 to 8 January, 2018. This capacity-building training will provide a unique and valuable opportunity for practitioners to exchange ideas and build their human dimensions skills. Training participants will attend sessions focused on community-based conservation and monitoring, education, human-wildlife conflict mitigation, communication, and more. The training will be immediately followed by the Pathways Africa Conference, where trainees will have the opportunity to participate. “Pathways has been stalwart in its mission to increase professionalism and excellence in the human dimensions of conservation and we look forward to this opportunity in Namibia to increase the understanding, skills, and capacity of bright motivated African early career practitioners”, said Michael Manfredo, Professor and Department Head of The Department of Human Dimensions of Natural Resources at Colorado State University. The inaugural Pathways to Success: Integrating Human Dimensions into Fish and Wildlife Management Conference and Training took place in Estes Park, Colorado 28 September – 2 October, 2008. This and the subsequent five conferences in 2010, 2012, 2014, 2016 (Kenya), and 2017 resulted in hundreds of research presentations by attendees from all around the globe. The diversity of high-quality presentations, enthusiastic participation of trainers and training participants, and the engaging dialogue across national, state and institutional boundaries all have helped to make this event successful. The conference is international in scope, with more than 30 different countries and more than 50 agencies represented at each respective event. Based on positive input received from attendees, Pathways continues to reach out to a diverse audience to increase professionalism and effectiveness in the human dimensions of fisheries and wildlife management field by repeating this conference biennially. “We are pleased that Namibia was chosen as the site for the next conference. Conservation is part of our country’s constitution, and a key component of our CCF mission is to train the next generation of scientists, ecologists and agriculturalists”, said Dr Marker. 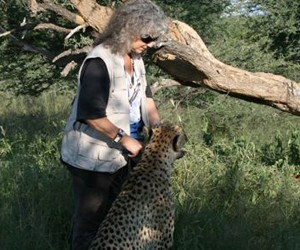 “Our holistic approach to conservation encompasses making Africa sustainable for the future”. Namibia’s internationally acclaimed, community-based conservancies, which are now looked upon as the model by other African nations, will be highlighted throughout the event. Sponsorship opportunities for Pathways Africa are still available; please contactconference@warnercnr.colostate.edu for more information. To register for the conference, please visithttps://sites.warnercnr.colostate.edu/pathways-africa/registration/.